There are just three days to go before voting closes for bit-tech's 2010 Mod of the Year competition. Nearly 1,000 votes have been cast so far, but fewer than 30 separate the top four projects so every vote counts. 18 projects are featured this year in all shapes and sizes, so there's certainly something for everyone. We've seen them on our front page and in Custom PC magazine over the last year, but you can take a look at them here just one last time if you need a refresher. What's more, we've even got some desktop wallpapers for you to download too. If you haven't voted yet, head over to the voting page to support your favourite projects, where you'll also be in with a chance of winning a fantastic modding ruler from Mnpctech. 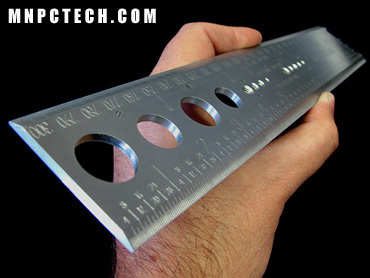 The first ruler made just for PC Builders and Modders. It measures inches and millimeters, and features a built-in computer screw gauge to determine the exact thread-size. Meanwhile, the templates save time when determining screw hole locations for internal and external drives. It also includes diameters for Vandal switches, water-cooling barbs and hoses. The ruler is CNC-milled from 1/8in-thick 6061-billet aluminium for use in the demanding environments, while all of the calibrations are CNC-engraved to withstand extensive wear. Congratulations to you all and check your emails, as we've contacted you about sending your prize. Finally, again don't forget to vote for your favourite project. There are still five more modding rulers to be won, and stay tuned because we'll announce the winner of Mod of the Year 2010 in just a couple of days.